"Lightbeam is a Firefox add-on that uses interactive visualizations to show you the first and third party sites you interact with on the Web. As you browse, Lightbeam reveals the full depth of the Web today, including parts that are not transparent to the average user." 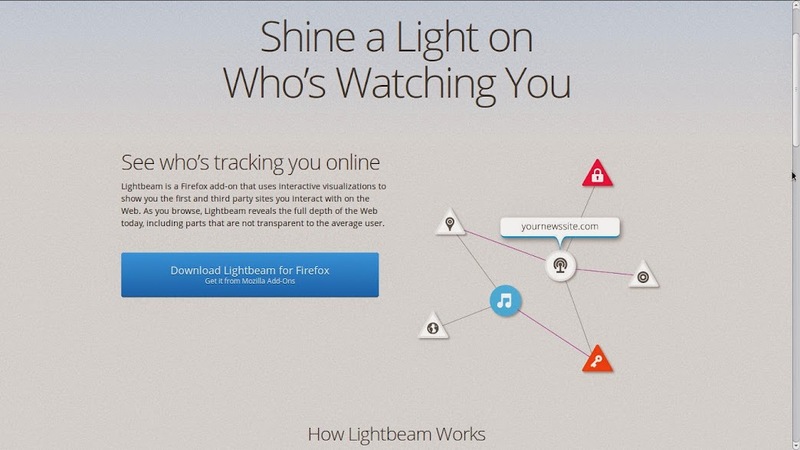 Mozilla’s free Lightbeam addon for the Firefox broswer shows who's tracking your online movements. On the one hand, Mozilla says the browser add-on will be 'a step forward in the fight for greater openness across the internet'; on the other, Mozilla is itself tracking you with low level information, under a disturbingly broad Terms of Service. 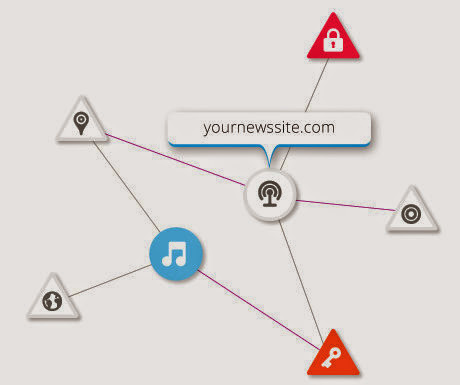 Lightbeam creates a real-time graph of all the tracking information built up from the cookies implanted in Firefox as you browse the Internet, allowing users to identify third-party sites that are tracking them online. 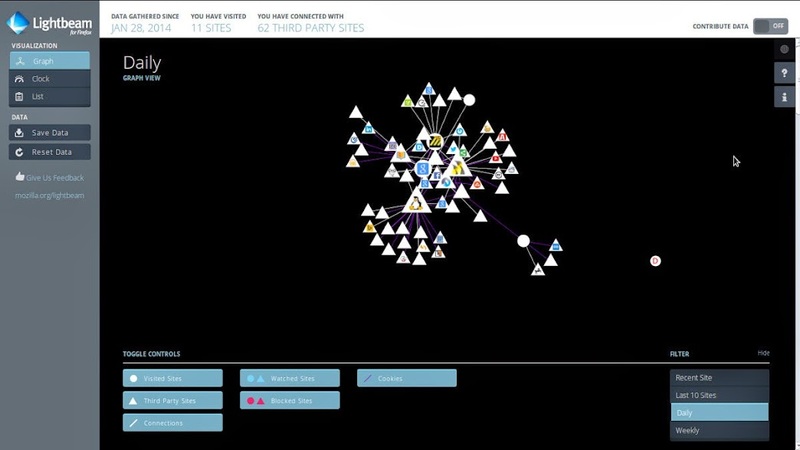 Lightbeam produces a cunning real-time visualisation charting every site that operates through those sites collecting and sharing user data. Zoom in, zoom out, trace the lay-lines of data tracking from site to site and, over time, you can see your very own personal world-wide web drawn in front of you. We know that browser cookies in themselves aren't bad; indeed, benign cookies that track sessions and manage shopping carts are of huge benefit; but there is a multitude of cookies whose sole purpose is to track, trend and target you for commercial (and indeed political) purposes. In a post-digital-era twist, Lightbeam itself can send anonymised information about sites and third parties tracking your movements back to the Mozilla Foundation for inclusion in its crowd-sourced database of trackers - although this itself has given some privacy watchers cause for concern. Without this feedback loop, Lightbeam might be of passing interest to consumers; I suspect few people will modify their browsing habits significantly after looking at the graph. But with the Lightbeam database shining a light on the hidden world of data tracking and privacy, exposing the sources of cookies, images, scripts and adverts, there is the possibility that web-users en-mass can pressurise or regulate unwelcome operators into modifying their behaviours. Or at least, make better use of Ad-block. If you download and run the Lightbeam add-on in your Firefox browser, it will create a record of events for every site you visit and every third party site cookie that is stored locally on your browser, and thereafter, track the sites you explicitly visit and the third parties who receive some or all of your tracking data. Lightbeam builds your graph over time as you browse the Web, based on its local database which you can query or delete at any time.